IR Infrared RC Tanks - What Are They? 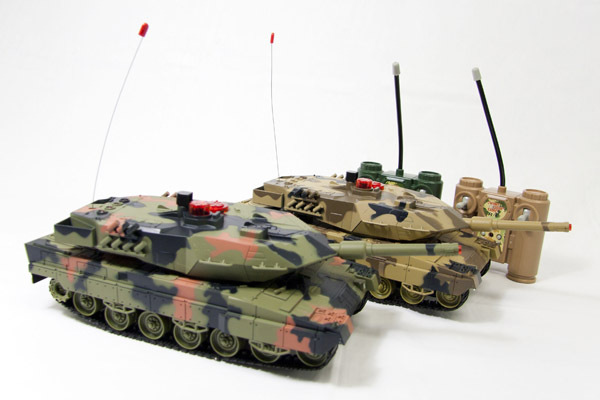 [caption id="attachment_29" align="alignleft" width="294" caption="Infrared IR RC Tanks"] [/caption] IR infrared RC tanks are typically smaller than their radio controlled counterparts. The main difference between IR infrared RC tanks and other normal RC tanks is that these toys are controlled through transmissions via beams of light, while the latter functions through radio signals. The operation of IR infrared RC tanks is similar to that of TVs, VCRs or DVD remote controls. Here, signals are sent from a transmitter in the toy’s controller through an infrared light beam. Thereafter, the IR receiver in the toy will pick up the signal and perform the commanded action. Pulses of infrared light are sent out from the IR transmitter though it’s LED in a code which the receiver will interpret and thereafter convert into specific commands such as making the tank turn left or right. The range of the IR signals in these toys is normally limited to not more than 30 feet. Your range may however be shortened by the strength of the IR signal, as well as interference from the sun or other devices that transmit infrared pulses. You should also note that in order to work, you will need to point the transmitter LED directly at the IR receiver. IR tanks may be micro-sized or constructed in the normal size. One benefit of using IR for RC tanks is that it will eliminate the need for an antenna on the tank or the controller which makes this toy safe for younger children to play with. Moreover, the limited range of infrared should not prove to be a problem for kids. Manufacturers have even come up with IR infrared RC tanks which are able to fire at one another through the use of infrared signals. Be careful though because taking a hit may result in damaged sound effects or having your tank temporarily disabled. Colin Nelsen loves playing with RC toys, having grown up with them. His favorite ones are the RC Tanks - of which he has over 10 different models, and he enjoys meeting other people who share his passion for RC.